As I sit here typing this, I do so knowing one simple fact, in less than 2 weeks, the Nintendo Switch will be celebrating its first anniversary! It has almost been one year since the Nintendo Switch launched and already the newer Nintendo platform has way too many games to keep up with and that includes the first party games. Wherever you choose to count Pokémon Tournament dx (Bandai Namco), and Fire Emblem Warriors (Koei Tecmo) as true first party games, in 1 single year of Switch, we got 1-2-Switch, The Legend of Zelda: Breath of the Wild, Mario Kart 8 Deluxe, ARMS, Splatoon 2, Super Mario Odyssey and Xenoblade Chronicles 2 and whether you like to admit it or not, it is quite the list. Not only are they good games though, 3 of them are absolutely huge (Zelda, Mario and Xenoblade Chronicles) and require hours upon hours to beat them, let alone complete them and Splatoon 2 is no 5 minute job either. Thanks to an online system and constant additional content, Splatoon 2 has almost doubled in size since it launched and it’s twice the game we first saw last year and just in case we did have the time to endure through all of them and find the time to play other games, Nintendo also helped us recently get our hands on Dragon Quest Builders, Bayonetta 1 and Bayonetta 2. So, even if every game mentioned does not apply to you, at least a couple of them do, so it’s not like you picked up a Nintendo Switch and then not purchase a single Nintendo title for them, but even though 2 of the games we did get last year are enhanced ports of Wii U games, with Breath of the Wild being a dual release, Nintendo did in fact deliver, without having to have their Nintendo Switch Online system in play and the likes of Netflix, YouTube and an internet browser available on Switch. But, as fantastic as it was, Year 1 of Switch is nearly over and Year 2 is soon to begin and sadly, right now doesn’t look good, unless you’re a fan of ports, which is just wrong. But what’s funny about this, is the two games that are being ports, which by the way do not in any way affect the development of new games for Switch as Nintendo have many different teams, with one being fixed team dedicated to their mobile titles, are actually 2 of the best games to ever grace the Wii U. I know Hyrule Warriors wasn’t perfect as it wasn’t anywhere near as popular as it could have been when it was ported to the Nintendo 3DS as Hyrule Warriors Legends, but it was still a great little hack and slash that got bigger and bigger over the years, in terms of content and gave us another touch of Zelda while development for Breath of the Wild continued. What’s more, although I would have preferred a sequel, especially since Fire Emblem Warriors has been out since September/October 2017, and have fully completed the game in both its previous forms, I am still going to play the hell out of the game and beat it once more and the fact it is to have more content (2 new costumes, an event viewer and an Item Card shop, which have all been confirmed,) it just means I get to enjoy a great title for that little bit longer. Still, it’s not just Hyrule Warriors Definitive Edition that’s being ported though is it? Donkey Kong Country: Tropical Freeze is also making a return and even without its Funky Mode, it is going to be great and do you know why? It’s because Tropical Freeze is cited as being one of the best platforming games ever and it is now coming to a portable platform that will let you play it anywhere you want, for as long as you want, before either the battery dies, or you have to get on with the other things in your life. Like many of you, I would prefer it if there was an upgrade/trade-in system at play, so it’s not as expensive to get my hands on the Switch versions, or at least have the means to carry over my save data so at least I could straight-up pick up where I left off but since this is the Nintendo Switch we’re talking about, I don’t see that happening. As much as I love the Wii U, it didn’t do anything for Nintendo and they didn’t do anything for it. They made great games for it, but failed to properly convey what the platform was and entice it to consumers and developers. So to ensure history didn’t repeat, they created a console that improved upon the Wii U and saw to it the consoles could not be connected to one another, despite them having a similar concept and some of the same games. The worst thing Nintendo did to the Wii U though, was they brutally murdered it and the Miiverse in front of the whole world last year, whilst flaunting the Switch right in front of it. The second they were done with the old console, Nintendo swept it under the rug and pretty much tried to make it out like the console never existed, as they moved some of its better games to a platform and gaming audience that would greatly enjoy them. I can understand those reasons as they make sense, in fact, they make so much sense and I know it’s insult to injury, but as a Wii U owner who would hate this, I would actually prefer it if Nintendo did bring most of their first party Wii U games to Switch, or at least a sequel to all of them. None of these ports are actually games the Switch needs as almost anything Nintendo related can be a success, as 1-2-Switch does continue to be popular, not anywhere near as popular as Mario Kart 8 Deluxe, which outperformed Breath of the Wild, but popular in its own right, but the sequels are a must. 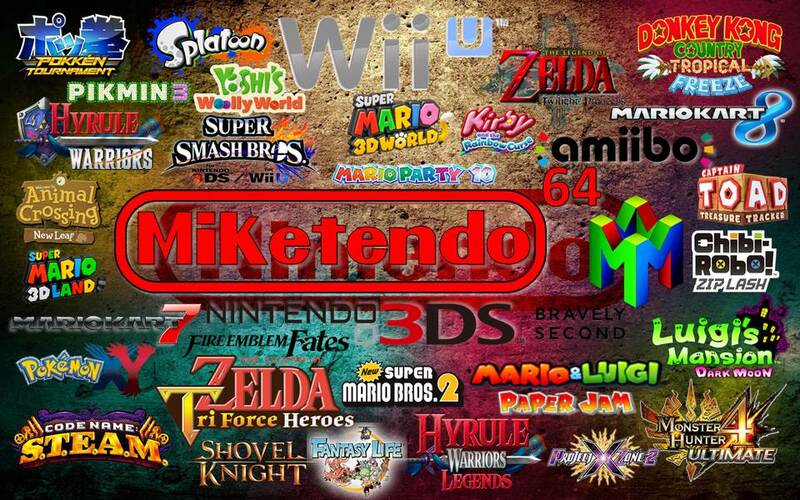 The Wii U hasn’t just died a painful death, it’s being erased from existence itself and the ports are the only thing that is keeping it alive, save for the loyal who still play it today as it still has some games that are currently an exclusive. But the ones that are being ported and have been ported already, it’s not just Nintendo doing a cash grab to get more money off old games, but it’s their way of extending the life of each game and their way of making some of their best games of all time, even better and available to those who never experienced them on the Wii U. After all, the Switch was intended for a different audience and not necessarily for those who have a Wii U, unless they wanted to upgrade. So the ports, are actually a good thing, a very good thing and so are the ports of indies and third-party titles, as like with the Wii U games, it brings something brilliant to an already brilliant platform and allows Nintendo to focus on what they do in the meantime and that is making sensational games that Nintendo fans can fall in love with. Also, no one is actually forcing you to buy the port, just like no one is forcing you to buy the physical release of a game you’ve already brought digitally. It’s not a case of the developer/publisher deliberately trying to screw you over and get more money out of you, but it’s a necessity of the trade. Like with anything, video games are a business and businesses require money to stay in business, especially the smaller indie companies who often have such a small budget that the developers often find themselves going bankrupt, just to finish the game and see it make its release. It’s not easy and they would all do a physical release, if they could from the get-go, but it’s just not possible for them at the time of release to say there will be a physical release, because they just don’t know at the time themselves. It’s only when they see the game selling that they can do the math and justify doing a physical release because otherwise, it is a gamble that could easily backfire on them and cause them to sell their house and live on the street. (Not an exaggeration, this can actually happen.) But, while you can say Nintendo is not some small indie developer, let’s not forget that the last few years had been bad for Nintendo as the Wii U did leave a bad taste in almost everyone’s mouths until Pokémon GO and Nintendo Switch raised the company to former glory. So, they are not infallible, but they are good at bouncing back and it is often the ports and remasters, which also help with their return as Mario Kart 8 Deluxe is the second best-selling Switch game and Pokkén Tournament. So, the ports (and remasters) are something that works and are essential to the longevity of the platform they are on, especially since the Switch is still hugely popular after nearly being in circulation for 1 year and interest has yet to wane, thus Nintendo are doing something right and part of that, are the ports. Should you feel differently though, you’re welcome to sound off in the comments below, but ports are important and they’re great games we can now take on the go, so whether or not they’re pricier and we need to start from scratch, what’s really wrong with that? That’s life and the video game industry for you! It’s not perfect, but when it works, it works.